Fall is a wonderful time of year, the harvest is in full swing, squash, pumpkins and gourds are in abundance. 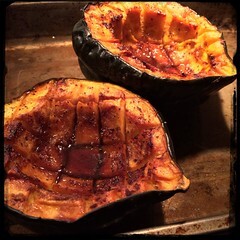 Here’s an easy recipe for preparing almost any suash… this one using Acorn Squash, it’s as healthy as it is delicious. 2. Wash and cut the acorn in half lengthwise from stem to tip. Scoop out the seeds and the stringy membrane. 5. Add salt, black pepper, natural sugar and cinnamon. 8. Bake for 1 hour to 1 hour and 1/2 or until flesh is is soft and the edges browning. Cook it well, so the flesh becomes soft throughout.